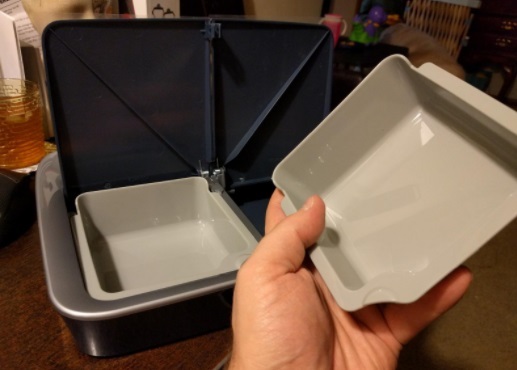 PetSafe Two-Meal Digital Cat Feeder Review - Is it Worth It? (3.8/5)PetSafe Digital Two Meal Feeder is a simple solution to feed your cat two meals every day. With a LCD timer, you choose what time you want your cat to be fed and knowing that your pet won’t be able to break into the feeder because it’s tamper-resistant. The feeder features two timers, one on each compartment. These compartments open individually and can be programmed to open within 1 up to 99 hours from the moment you program it which is as good as a 7-week digital timer, but being as simple as it is. Each compartment holds a removable BPA-free plastic tray that is easy to wash and dishwasher safe. 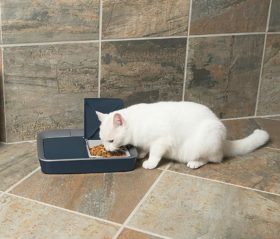 The PetSafe Digital 2-Meal has a small footprint so you will able to fit it anywhere in the house. Compartments open at the programmed time, individually. Programs two meals within 1 to 99. This allows you to program meals up to 4 days in advance. Battery operated. It works with 4 x AAA alkaline batteries, not included. 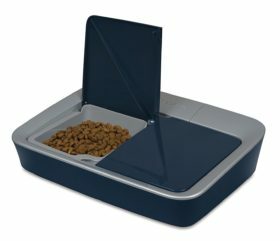 The PetSafe digital 2-Meal feeder is easy to use. 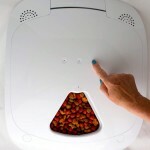 Simply open the food compartments by pressing the “PetSafe” button. Fill the trays with dry food making sure to level the food so it doesn’t have areas with piled up food that may interfere with the lids from shutting. Then close the lids and program the meals. To program the unit you need to count the hours (e.g. 1, 2, 3 hours, etc.) from the time that you program it. It’s not a clock timer, it’s a countdown timer similar to a microwave. So for example, if you program the unit at 3 pm and you want one of the lids to open at 6 pm you need to program it for 3 and the lid will open at 6 pm. Then you need to do the same with the other lid, both lids are programmable separately and can be programmed up to 99 hours between both. To program, press a button on each lid to instruct in how many hours to open by pressing the button on + to add hours and – to reduce hours. Due to the nature of the timer, you need to program the unit every time after use. You can only program hours and not minutes due to the countdown system. When it’s time for the lid open gets less than an hour, the display shows the number of minutes remaining. This countdown timer of the Petsafe Digital Two-Meal is basically the same than the Petsafe 2-Meal. 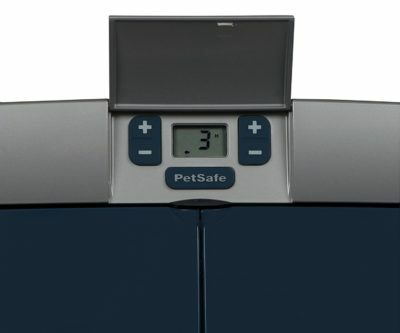 The difference is that the Petsafe Digital features a digital panel where you can push a button to add hours to program it and the original version features a dial. Note: After setting the timers you will be able to see the countdown showing on the LCD display, but after an hour the countdown disappears, this is normal and it doesn’t mean the feeder is not working. CAN IT BE USED TO FEED 2 CATS? Yes. As each compartment has an individual timer, this can be done. However, as the time starts a countdown immediately after you press a button with a number of hours, in order to get both lids open at the same time you will need to press both buttons simultaneously and add the hours for each. By doing this it may still be a difference of a second between each. Tamper resistant. There’s no gap between the tray and the feeder where your cat could insert its claws. The only way to open the feeder is by pressing the PetSafe button. You can program it up to 4 days in advance. Simple concept. Easy to determine the hour for each tray to open. Can’t be used for wet food, unless you feed your cat within 10 hours at cool temperature. Make sure to fill the feeder without your cat being present because it will want to eat right away and you will lose one programmed meal. If you want to feed your cat 3 times a day, you can place a bowl in the morning and then leave the feeder programmed for the other 2 meals. Make sure to check the battery life. The LCD screen on the feeder will display “LB” to indicate when the battery is low. 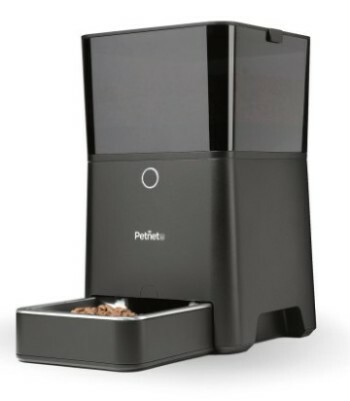 PetSafe Digital Two-Meal feeder is a nice basic digital unit to feed your cat dry food and a good option for cat owners that need to space out the feeding instead of placing a full bowl for the cat. To feed your cat at specific times of the day such as 4 am, or late evenings in case you work odd hours and can’t make it home to feed your cat. 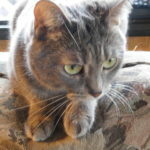 If you want to feed your cat in the morning in a bowl and then forget about the other 2 meals by leaving the feeder programmed for the other 2. This solution would make your cat eat 3 meals a day. If you want to feed your cat wet food (unless feeding your cat within 10 hours at a cool temperature).